Story: From the beloved director of Chocolat and the Oscar-winning screenwriter of Slumdog Millionaire comes the inspirational comedy Salmon Fishing in the Yemen. 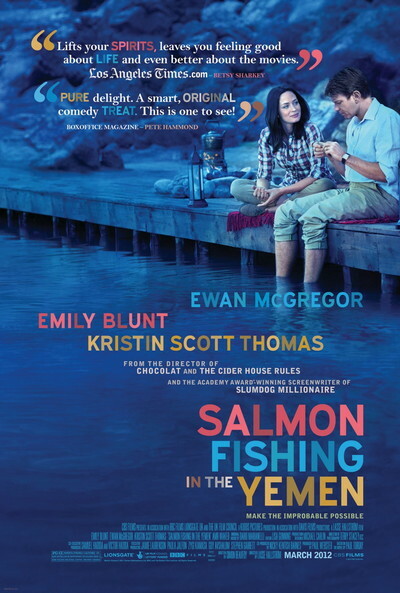 A visionary sheik (Amr Waked) has a big dream - to bring salmon fishing to the desert. Willing to spare no expense, he instructs his representative (Emily Blunt) to turn his dream into reality, an extraordinary feat that will require the involvement of Britain's leading fisheries expert (Ewan McGregor) who happens to think the project both absurd and unachievable. That is, until the Prime Minister's overzealous press secretary (Kristin Scott Thomas) latches on for its potential as a 'good will' story. Now, this unlikely team will put it all on the line and embark on an upstream journey of faith and fish to prove the impossible, possible.